It’s Thanksgiving week which reminds me that it is a good time to reflect on the many blessings we at Skuna Bay have been afforded this year and since our inception in November of 2011 in Southern California when we delivered our first salmon to a chef. It sure has been humbling to have some of the greatest chefs in North America ask for and appreciate our salmon. When we began this journey two years ago with our first distributor partner Santa Monica Seafood, we had no idea where things would go. We knew we wanted to achieve two things: one we wanted to give chefs a great salmon experience every time they ordered it so that they could always have confidence that they would be putting their best in front of their customers. And two, we hoped to show that it is possible to responsibly rear salmon in its natural ocean environment with more attention to detail and with a focus on high standards. We hope we are achieving that but the task is never complete. The question I get asked the most seems to be "how do you ensure great texture?" Texture drives all in a salmon experience and the variables that determine great texture are mostly controllable. So that's what we focus in on. The big picture is water that has a strong tidal current so fish are swimming against resistance and building up strong muscles. Lower pen densities are important too so the fish has room to swim. At harvest is the most critical time - we must make sure the fish are neither stressed nor fatigued because that would introduce lactic acid into their muscles and would affect texture. We ensure we harvest in small "pockets" and time it so the fish are in the pocket no longer than one hour. Then we move our salmon to the processor so they are inspected, selected and packed before they go into rigor so no one is handling a stiff fish and possibly tearing their fillets. The final piece is that closed system where, once the fish is packed, no one opens the box till it arrives in the chef's kitchen. That way, the fish always maintains the right temperature and stays like it was when it came out of the ocean. 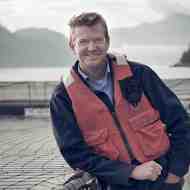 I am a salmon farmer and very proud to be doing what I am doing. I have farmed fish for 25 years in Scotland, New Zealand, Canada and I even spent two years in Papua New Guinea as a volunteer helping people set up their own farms in order to feed their population. 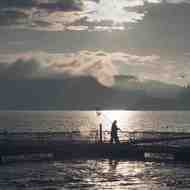 I believe raising salmon in their natural ocean environment is one solution to the world’s problems. We help feed the world and in the process reduce pressure on the wild salmon populations. In fact, if there was enough wild salmon to go around we certainly wouldn’t need to exist. But there isn’t and we can help with that. 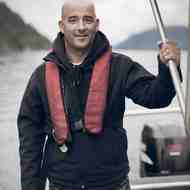 We realize not everyone in the world does a good job farming salmon but we are trying to show how it can be done right. And now with our development of Skuna Bay, we are challenging the status quo – trying to show great chefs in Vancouver (but also all over North America) how salmon can be raised responsibly. We hope that you will help us deliver on that vision. We face a sea of choices when it comes to diet and good health. . .but salmon is one choice that offers so much when it comes to quality nutrition and fits swimmingly into our healthy lifestyle! Salmon is a nutritional powerhouse, best known perhaps for being the highest whole foods source of heart-healthy omega-3 fats. But it’s also an important supply of a number of other key nutrients essential to health. As a doctor of public health and registered dietitian working with clients, I am often asked what a person should eat for optimal health. The good news is that there clearly are some delicious foods that enhance health when eaten frequently, while other foods may do the opposite. And as a food enthusiast who works with professional chefs and at-home cooks—enjoying delicious meals in both settings frequently—I know that when it comes to food, while health is essential, flavor is also key. YEARS AS A SALMON FARMER: 16 WHY YOU BECAME A SALMON FARMER: I have always been fascinated with the life cycle of salmon and have been working with them all of my life….. Salmon conservation, salmon enhancement, and then salmon farming. Salmon farming was a natural direction for me to take and I’m both happy, and proud to be a part of raising food for the world in a sustainable way. WHAT YOU LIKE MOST ABOUT RAISING SALMON IN THE OCEAN: I have the most beautiful office setting in the world. Some of the most incredible experiences I’ve had in nature happened while I was on the salmon farm in the Pacific Ocean. I’ve seen whales, dolphins, eagles, seals, sea lions, bears, and wolves just to name a few. Thursday, Sept. 6th: Last flight to Newark, NJ, only direct flight to NYC. 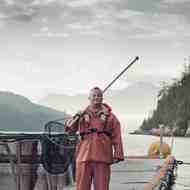 Off to the Open to see, taste, smell how the Open's great chefs are preparing their Skuna Bay Salmon. Friday, Sept. 7th: 10 AM: meeting at Food and Wine magazine for a private Skuna Bay unveiling and tasting for Tina Ujlaki and the chefs from the test kitchen. Top Chef Jen Carroll meets us at the door with her own special knives. Jen loves our salmon and agreed to fillet the fish and give her own special insights into why she likes it. We meet Tina - she seems intrigued. Takes us to the test kitchen where one of our customers, Jonathan Sawyer from the Greenhouse Tavern in Cleveland happens to be. Hugs and high fives for everyone! This week our standards and our commitment was tested. It wasn't easy for our Craftsman Farmers. But they refused to compromise their standards and fly our fish to the market. Here's what happened: - one of our customers had an administrative snafu this week and their order was held up in their outbox: the order was missed - when we discovered this important order was missed we had a choice: fly the fish to market, miss the order or send another truck. WE NEVER FLY OUR FISH. Our Craftsman Farmers are serious about this because in addition to helping us keep our carbon footprint low (sending fish on a plane pumps out tons of carbon - sending it on a truck is better), it ensures we keep control of the cold chain and ensure our fish are never left on a tarmac somewhere. We also think customers should see a benefit from these high standards and not be penalized - so missing the order was out of the question. Unfortunately the folks at the Shedd Aquarium cannot accept our invitation. We are disappointed but understand how busy everyone gets. That being said we think it would have been a great place to begin a dialogue and to demonstrate what progressive craftsmen can do to lead the way while helping to feed the world. It should be noted that we think the people over there are good people. They are trying to do an important job, that is educating people on what it requires to use our ocean resources responsibly and to promote that cause. It is a good cause, one that aligns with our values as craftsmen farmers. So while we can agree to disagree on some things, we support their overall intentions, even though they won't be coming to see our farms for themselves and observe how we are leading the way in responsibly raising good fish for America to eat. 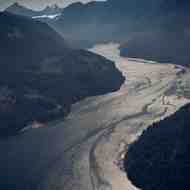 And while we do that, helping to save wild salmon in the process. We heard recently from one of our chef friends about the Shedd Aquarium's promotion of another new salmon farm, this one farming in a lake. A great thing, we support anyone who wants to raise good fish and be good for the environment in the process. We always get asked, what is so different about Skuna Bay? As you can imagine, when you say you are different, people have high expectations.